Taught by Ben Teeter, 6th Dan, basics class is a great place for new students to begin. These classes have the most consistent curriculum, which allows students to practice a set of fundamental techniques and body movements on a regular basis. Students of all levels attend to continue refining their basic movements and to train with newer people. Classes begin with either Ken or Jo suburi (solo forms with wooden sword or short staff) and then move to tai sabaki (body movement) and ukemi (rolling and falling). The second half of class focuses on aikido techniques with an emphasis on the first sets of techniques that students are expected to learn. 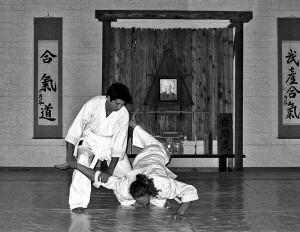 Basics class involves kihon training (basic or foundational training) in which aikido techniques are performed slowly and precisely from a static position. This not only gives newer students a chance to see what nage (individual applying the technique) is doing, but also gives students a chance to safely practice their ukemi (receiving the technique). Aikido Basics Class meets Mondays and Wednesdays at 6:00 pm.